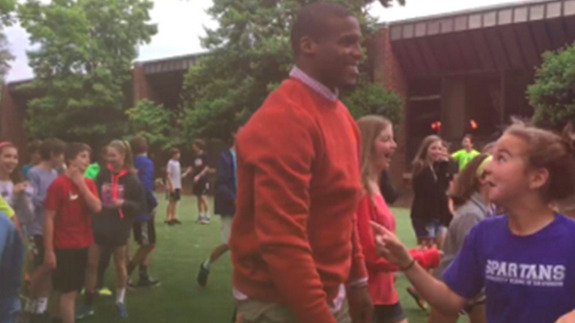 Cam Newton made a surprise appearance at a middle school playground football game - trendistic.com: ever tried. ever failed. no matter. try again. fail again. fail better. Cam Newton has a new group of teammates. The Panthers quarterback was driving through Davidson, North Carolina when he passed a group of seventh-graders playing football on the Community School of Davidson playground. And when Newton noticed one of the kids was wearing a Cam Newton jersey, he did what any renowned NFL star would do — he hopped the fence and joined in the game.